A great story about overcoming challenges, striving for hard to reach goals, building friendships and making memories. This show will make you laugh. It will bring tears to your eyes. You will leave feeling as if you just ate a warmed steambun- happy, content, and full. At least, that is my simile. The characters are great and the story is simple, albeit intriguing. A great slice-of-life storytelling experience. I recently "got into" anime. When I was a kid (WAY too many years ago), the extent of my anime exposure was "Battle of the Planets", "Transformers" and "Robotech". Big robots, recycled animation cells and awkwardly dubbed English dialog were what I remember. So last year, when a friend who knows I like sports movies recommended a "neat anime" about a Japanese, high school volleyball team called "Haikyu!! ", I was dubious. Nevertheless, I decided to give it a shot. And I am so thankful that I did. That show opened the door to what has become a bit of an obsession and in the last eight months or so, I've consumed around 50 different anime series representing multiple genres. And this brings me to "A Place Further Than the Universe". I read somewhere that "they'll make an anime about anything" and thank God for that. 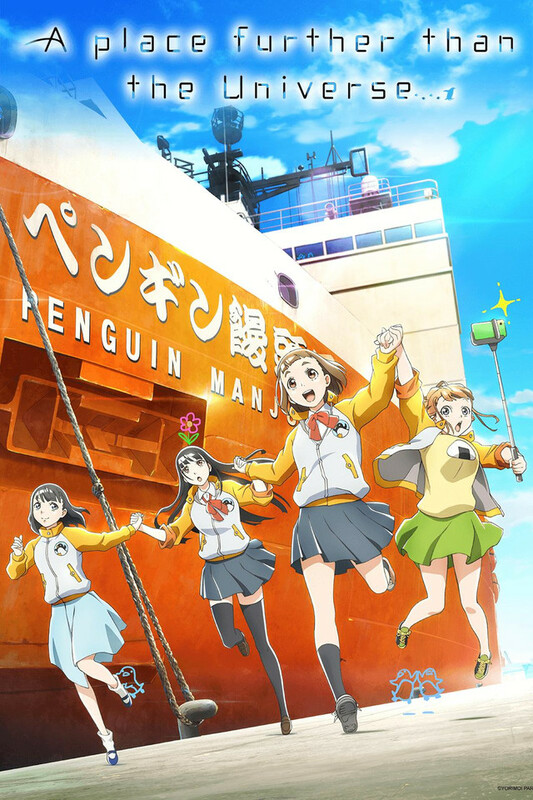 I truly don't believe a western series or movie (animated or live action) would ever be made about a group of high school girls taking a life-changing voyage to Antarctica. I've seen some hilarious anime ("Toradora! ), some freaky anime ("Another") and some fist-pumping anime ("My Hero Academia"). I have NEVER seen an anime, or any show for that matter, like "A Place Further Than the Universe". This series is kind of difficult to describe so I'll just list some words that come to mind: Original. Hilarious. Cute. Thoughtful. Beautiful. Sweet. Clever. Remarkable. Heartbreaking. I'm not going to give any major spoilers because anyone who is a fan of anime or just amazing stories in general needs to watch this series without preconceived notions. I will, however, challenge anyone who witnesses the culmination of Shirase's quest to find her mother to make it through the episode without bawling like a baby. Full disclosure; I'm a cynical and jaded cop by profession and this little show brought tears to my eyes more than once. I am thankful I found it and I think you will be too. It's a masterpiece, a title that I gave to only two other anime ever. That all I got to say about it. But Crunchyroll says that I have to have more characters in order for this to count as a review. So I will break the fourth wall in order to say that Hinata is best girl. This anime was a rollercoaster of a ride from beginning to end. The raw dialogue showcasing the nuances of friendship was both refreshing and a sprinkle of reality. The production team definitely put in the hours as the animation was crisp and clear. The soundtrack for this anime was also impeccable, as the songs that would play in the scenes enhanced the emotions that we felt. I would definitely recommend this anime and it is definitely the best anime of the Winter 2018 season. This show kept me on the edge of my seat on the verge of tears in every single episode. Perfect ending and I wouldn't have wanted it any other way!!! I still wish we get to see more of these girls adventures as time goes by. This is truly a masterpiece!!!! This series was so good. The only big downside is how suddenly all of my previous travels seem so short and easy in comparison - and nothing I can think of for the future beats three months in the Antarctica. But that's not my dream. I'll come up with my own and work towards it - hopefully with friends. Anyway, this show... I cried, I laughed, I got lonely, I reflected on how I at least have a few good friends like this and felt hope. World seemed bigger and brighter while watching the show, and still feels. Such great atmosphere, music, directing, dialogue. The characters had depth, history and their own ways to see the world. They all handled hardships in their own ways, and they all tried to help each other out. It's always great to find anime that handles topics and themes I've never seen presented quite like this. Antarctica is one, for sure. Then there's grief, obsession, dreams, finding yourself, friendship, journey, personal growth... While Shirase was the only one whose long-time dream was to go to Antarctica specifically, everyone who went got something out of it. Loved the bit at the end showing Megumi pulling a similar stunt as Kimari - I hope she got a chance to heal, become more independent and grow as a person. It's also a nice reminder that even while you are away, life goes on back at home - and not always in the same, monotonous way. I checked out this show because of the anime awards and the incredibly positive ratings, and didn't regret it for a moment. While mostly light-hearted, the show is not cutesy and we see from the first episode that this is about young women on a mission -- to get to a certain place, to change their lives, etc. The girls are cute, and the animation and setting are beautiful, but this show is really about the 'feels.' I didn't cry (I suppose I'm either too macho or emotionally stunted for that), but I can see why a lot of reviewers did. These girls, though amusingly innocent at times, have a lot of emotional challenges to deal with over the course of their adventure. Observing them was an entertaining and rewarding experience. character development, storyline, art, voices, everything in this anime is so well done, well paced, and beautiful. I laughed, I balled my eyes out, and I thoroughly enjoyed it. I'm not one to usually write reviews, but this show deserves it. If you're looking for something to satisfy you, this is it. I'm sad it's over, but this anime is definitely going to find its way in my collection on my shelf one of these days. 10/10 amazing! What starts out as a wholesome, cute, and hilarious little show progresses toward emotional depth that really tugs at your heartstrings. Each of the girls are enjoyably unique and bring different vibes to the overall story; the overall growth we see throughout the story's progression of each girl is inspiring to see too! The art, story, characters; EVERYTHING WAS PERFECT! Can't recommend this anime enough; it was definitely worth the hype.